Imagine relaxing at the water’s edge with the beauty of the Great Smoky Mountains all around you – it really a combination of two of the most beautiful and peaceful sights you can think of. 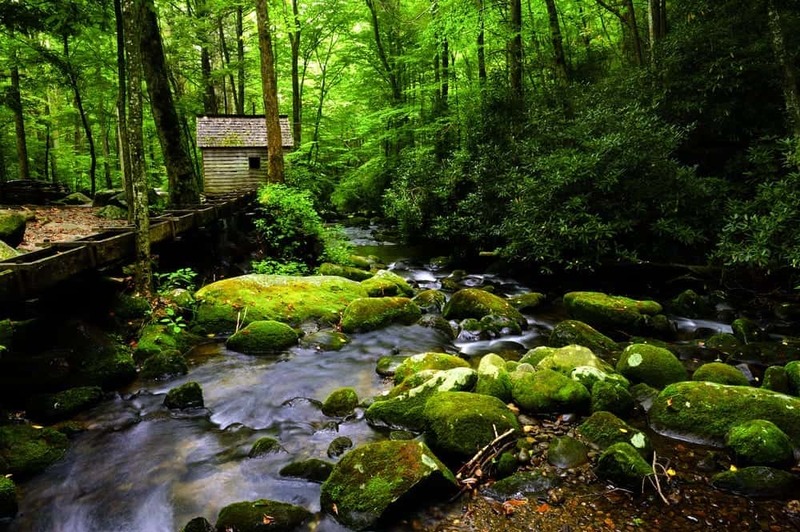 We can offer this beautiful scenery and more when you rent one of our secluded Smoky Mountain cabins on the river. And with the ability to choose from rentals located on the Little Pigeon River, Caney Creek, Cove Creek and other waterways, several size options and numerous amenity possibilities, your cabin is sure to keep you comfortable and entertained for your entire stay. But this is just one of several benefits associated with our riverside cabins. Keep reading to learn about four surprise perks of a waterfront stay at a cabin in the Smokies. It’s no secret that many families and groups of friends vacation in the Smokies in hopes of finding peace and relaxation. Luckily, our cabins offer exactly that. When you’re tucked into the Smoky Mountains with the sounds of the river nearby at one of our secluded cabins, you couldn’t be more at peace. Our cabins are far away from the hustle and bustle of everyday life and hectic schedules and are only a short drive away from downtown and the strip – just far enough away to escape the city noises. So after returning home from an exciting day in Gatlinburg and Pigeon Forge, the calm and quiet of your cabin will be waiting to welcome you home. By choosing a riverside cabin, you are instantly adding value to your vacation. In addition to offering amenities like Gatlinburg cabins with swimming pools, game rooms, hot tubs and fire pits that ensure your stay is both peaceful and fun, our secluded Smoky Mountain cabins on the river have a free, built-in entertainment and relaxation aspect – the river itself! There’s no need to venture out and spend money in search of an activity to wear the kids’ energy down or suitable picnic spot. With the river right outside your home away from home, you have all the outdoor scenery and fun things to do you could ever need. Now, we’re certainly not saying to stay holed up in your cabin during your entire trip, but it’s good to know you could if you wanted to. If you’re looking to add even more value to your secluded Smoky Mountain cabin stay, check out our Gatlinburg and Pigeon Forge cabin specials. Our secluded riverside cabins are perfect for vacationers looking to explore. Children will delight in the discoveries they can make at the river’s edge, while adults will love being able to keep an eye on them with a view of the river from a comfy seat or in the hot tub on their private deck. A cabin alongside a river also poses the perfect opportunity for fishing. All that’s left for you to do is grab a comfy chair, a pole and a lucky spot where you think the fish will be biting. We can’t guarantee you’ll catch the big one, but you’ll certainly have fun trying. Of course, we do urge visitors to use caution when exploring the rivers and creeks surrounding their cabins, as safety should be your primary concern. Be sure to be cautious of water levels and strength, slippery and wet rocks, and wildlife that inhabit river areas, like snakes. When you stay at one of our secluded cabins on the river, you have everything the Great Smoky Mountains has to offer convenient to you. Surrounded by the Smokies with waterfront scenery to accompany it, you have some of the best views and photo opportunities conveniently outside your rental. There is plenty of fun to be had at your cabin and the nearby river, but Pigeon Forge and Gatlinburg are also a short car ride away, offering exciting attractions, local eateries and shows of all kinds, as well. For the most part, anything you could want or need is ready nearby – it’s the definition of a vacation. To learn even more about the benefits of staying at a secluded Smoky Mountain cabin on the river during your next vacation, give us a call today! Our experts can help you and your family find the right cabin and answer any questions you may have.